Cloud Warriors celebrates the power of the cloud. The contest creates a frenzied online data search resulting a real life 'digital' race and the competitive excitement of feeding tweets into a TwitterWall. Cloud Warriors is a whole new sport played by people using their smart phones, to win cash and prizes. FREE ADMISSION! First come first serve. This is a fun game where real people win real money for using their phones, or other devices. Cloud Warriors is a unique two hour live event 'game' that’s played by people using their personal devices to surf the web and jam a Twitter Wall with answers. First one wins. The very first debut game will occur on Tuesday Feb 24th 2015 at Cagney's Wine Bar in Streetsville (Mississauga) Ontario. I wrote a comprehensive prediction of Cloud Warriors happening on Frugal Shopper. This is a debut event - we really don't know what's going to happen. Participants are expected to use their phones to research online info which are answers to questions read aloud by the HOST. Once they secure the necessary facts, participants must continue using their devices to tweet answers with the hashtag #CloudWarriors (so it appears on the Twitter Wall). The first correct answer (tweet) to appear will WIN the set cash reward and bonuses where applicable. A Grand Prize TBA donated by TeraGo Networks cloud services goes to the big winner.. You can read even more details about the breakdown of the Cloud Warriors game on Red Flag Deals. This real life attraction is a monument to our modern age and celebrates the cloud computing technology that makes the game possible. Cloud Warriors is produced by SURROUND Digital Marketing Agency in Oakville Ontario as part of their business myth making and concept storytelling program - there is no better way to understand something than to fight over it. Mississauga Life Magazine wrote about Cloud Warriors and said its the only time when its socially acceptable to be on your phone all night. 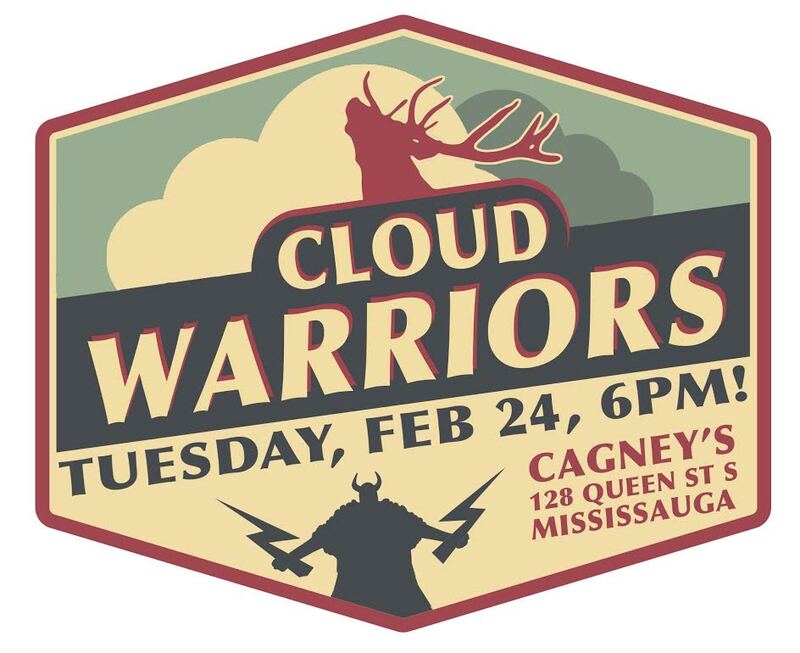 Toronto City Events DebLewis blog has more details about the 24 Feb Cloud Warriors event at Cagney's Wine Bar All attendees who participate must sign release forms, be over 18yrs of age, and leave contact information. Cloud Warriors is a trivia game played on a Twitter Wall that debuted in Mississauga Ontario last Tuesday Feb 24th 2015 with much critical acclaim. The ninety minute game is real fun to play and works well for web marketing a restaurant or dance club. It unites a real life community behind the host venue. 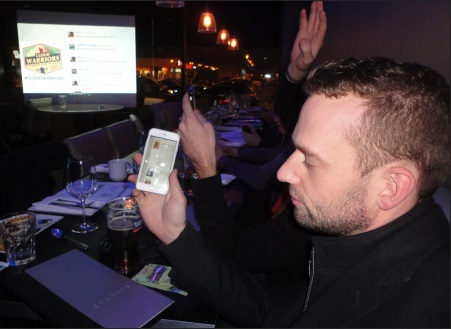 The initial cloud warriors launch event at Cagneys in Mississauga was sponsored by four different firms who used the storytelling in the actual trivia questions of the game to spread knowledge of their real life business. For example a local Master Mechanic automotive garage owner asked folks to find and post their address. The host bar sponsored questions about the menu and gave away menu items as rewards. In Cloud Warriors, a charismatic host asks twenty one really hard questions that any dumb guy with a smart phone could answer provided they're not all thumbs. The game is not so much about how smart the contestants are, but rather, how well they can search things and how fast they can find the correct information they seek and how skilfully they can tweet the correct answers beside the #cloudwarriors hashtag so they appear on the Twitterwall - the first correct answer tweet to appear wins the cash. Surround digital marketing agency debuted the game and hosted a heckuva party at the bar. The grand prize was donated by a cloud services company was a high quality WiFi antenna designed to log onto free networks a 1/2 mile away. In summary, the first Cloud Warriors event raised the profile of a neighborhood pub in Mississauga and tripled bar sales on am otherwise slow night.